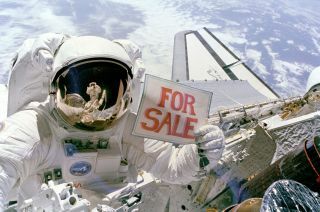 NASA astronaut Dale Gardner holds up a "For Sale" sign in a nod to the malfunctioning satellites he and Joe Allen salvaged during space shuttle Discovery's STS-51A mission in 1984. Gardner, 65, died on Wednesday, Feb. 19, 2014. NASA astronaut Dale Gardner, who in 1984 achieved the world's first space salvage during his second shuttle mission, died on Wednesday (Feb. 19). He was 65. Dale Gardner made history becoming the last of six astronauts to use the manned maneuvering unit (MMU) jetpack as he worked to return two malfunctioning satellites to Earth. One of the so-called "Thirty-Five New Guys" (or "TFNG") who NASA recruited in 1978 to train for its then-new space shuttle, Gardner flew twice as a mission specialist aboard the orbiters Challenger and Discovery in August 1983 and November 1984, respectively. Gardner's first spaceflight blazed a new path through the black sky as the first shuttle mission to launch and land at night. The six-day STS-8 mission, which marked the third flight of space shuttle Challenger, deployed INSAT-1-B, a communications and weather satellite for India, while also testing the orbiter's robotic arm and, in a first, the space-to-ground communications using a new Tracking and Data Relay Satellite (TDRS). Gardner's STS-8 crewmates included commander Richard Truly, who had piloted the shuttle's second test flight, pilot Dan Brandenstein, and fellow mission specialists William Thornton and Guy Bluford, the latter being the first African American in space. It was only the second mission to fly with a crew of five, the largest contingent launched aboard a spacecraft at the time. Gardner returned to space with the second flight of shuttle Discovery as a member of the STS-51A crew. The eight-day mission first launched two Canadian communication satellites and then, in a move that made history, retrieved two malfunctioning satellites for their return to Earth. The Wester 6 satellite for Western Union and Indonesian Palpa B2 satellite were deployed on a previous shuttle flight but had failed to reach their proper orbits due to failed motors. On the successful completion of their salvage work and in a humorous nod to the malfunctioning satellites, Gardner revealed a hand-drawn "For Sale" sign, posing for a photo that would become one of the most iconic shots of the 30-year space shuttle program. Landing Nov. 16, 1984, Gardner logged a two-mission total of 14 days and 52 minutes orbiting the Earth, including 12 hours and 14 minutes performing two spacewalks. Dale Allan Gardner was born Nov. 8, 1948, in Fairmount, Minnesota, but was raised in Clinton, Iowa. Graduating in 1970 from the University of Illinois, Gardner entered active duty in the United States Navy and was assigned to flight officer training in Florida and Georgia. Awarded his officer wings in May 1971, Gardner reported to the Naval Air Test Center at Patuxent River, Maryland where he was involved in the initial tests and evaluations of the F-14 "Tomcat" fighter jet. He then served with the Navy's first operational F-14 squadron during two tours of the Pacific aboard the USS Enterprise. From December 1976 until his selection as a member of NASA's eighth class of astronauts in 1978, Gardner was assigned to the Air Test and Evaluation Squadron at Pt. Mugu, California. After reporting to Johnson Space Center in Houston and finishing a year of basic training, Gardner served as the astronaut project manager for the shuttle's flight software prior to the vehicle's first flight in 1981. Following his two spaceflights, Gardner was training to fly a third time to space when the shuttle Challenger was lost in January 1986. Assigned to the first crew to launch into a polar orbit from Vandenberg Air Force Base in California, the mission — and West Coast shuttle launch capability — was canceled in the wake of the tragedy. In October 1986, Gardner retired from the astronaut corps and was assigned by the Navy to U.S. Space Command in Colorado Springs. For two years he acted as the deputy chief of Space Control Operations in Cheyenne Mountain before being promoted to Captain and becoming deputy director for Space Control at Peterson Air Force Base. In that position, Gardner's responsibilities included surveilling and tracking all man-made objects in Earth orbit and the protection of U.S. and friendly space systems. In October 1990, Gardner departed the Navy to accept a position with TRW, Inc. in Colorado Springs as a program manager involved in the development of both civilian and military space and defense high technology programs. In December 2003 he joined the National Renewable Energy Laboratory in Golden, Colorado, where until 2013 he was managing the applied research and development activities for biofuels, fuel cells and advanced transportation within the laboratory. A recipient of the NASA Space Flight Medal, Gardner was also awarded the Defense Superior Service Medal and the Distinguished Flying Cross, among other honors. Dale Gardner had two children with his wife Sue Grace Ticusan, who he divorced in 1992.